Our puppies are raised in the home. All adult breeders have been CERF eye tested. One year genetic guarantee, micro chipped, shots appropriate for age, worming, and vet checked. Most of our puppies are from Championship lines. 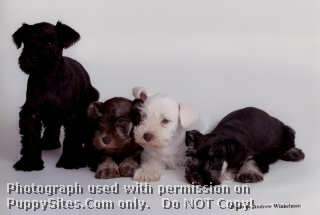 We breed black, black & silver, salt & pepper, liver pepper, liver & tan and Parti. Great personalities. You will not find a better breed that is an all around pet. Welcome to Hemlock Schnauzers. 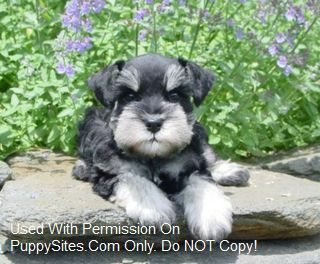 We raise AKC Registered Miniature Schnauzers. My dogs are not kenneled and live here in our home. Pups will be handled and socialized preparing them for their new homes. They will have their tails docked and dew claws removed. Ears will be left natural. Pups are vet checked with my local vet. My pups come with a (1) year Genetic Health Guarantee. My adult dogs eyes are CERF tested.